This winter, hardware stores in Maine are selling a lot of shovels, roof rakes and, surprisingly, mailboxes. 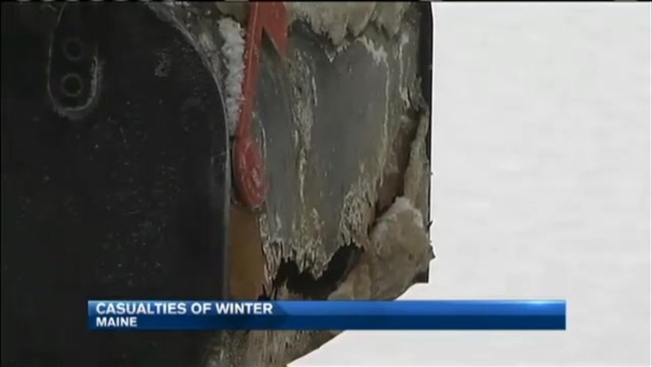 The snowy season is taking its toll on mailboxes along the roads. Too many passes from plows are leaving them buried in snow banks. Others are left listing to the side and some are broken beyond repair. One homeowner has covered his mailbox in duct tape to try and keep his mailbox intact. "That mailbox is going to lose every single time," said Ray Croteau, who duct-taped his mailbox in an attempt to keep it sturdy. Snow-Removing Equipment, Crews Arrive in Mass. melts and homeowners see how much damage they have to repair.